The Digital Research Library of Illinois History Journal™: Log Cabin Inn, Pontiac, Illinois, on Route 4, later to become Route 66. Log Cabin Inn, Pontiac, Illinois, on Route 4, later to become Route 66. 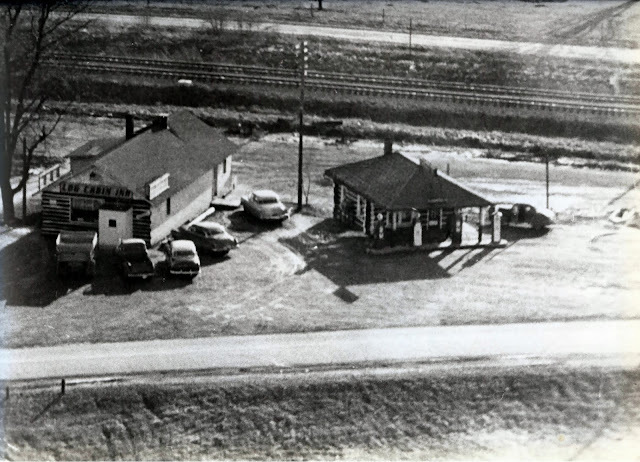 When Route 4, later to become Route 66 was re-positioned through Pontiac, Illinois in 1926, Joe and Victor "Babe" Seloti built a lunchroom and gas station and named it the Log Cabin Inn. 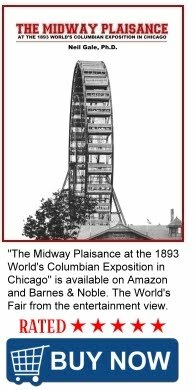 The Log Cabin was built of cedar telephone poles and seated 45 customers. The interior still has the original knotty pine walls. In a small window lined building behind the restaurant, Joe would lure customers to watch with the aroma of his secret recipe beef and pork barbecue cooked on a big spit. Meanwhile "Babe" would be next door filling gas tanks and fixing flats. In later years, Route 66 was made four lanes and relocated to the west side of the Log Cabin. the building was lifted up and turned around literally by horse power to face the new road. It was such an extraordinary event that hundreds from town came to watch. When the "Talking Crow" arrived-no one remembers. An elderly judge presented Joe Seloti with a pet crow and Joe painstakingly taught the crow to talk. And talk he did! That crow could carry on a real conversation with a customer. He was most chatty when Joe was cooking. The crow would demand something to eat and be very specific about it! Joe built a caged area near the BBQ spit behind the restaurant. After a while, the "Talking Crow" became a popular roadside attraction. Customers would stop to get gas or a meal, hear the crow chattering away and go around back to investigate. During the summer months, beer drinkers would gather at picnic tables in the back. 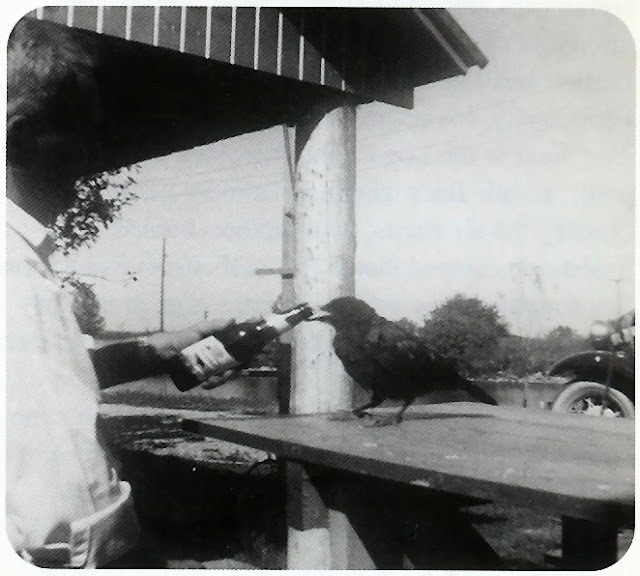 The "Talking Crow" would join them and became quite fond of malt liquor! Once meeting the bird, tourists would come back on their return trip hoping to converse again with the extraordinary creature. After charming hundreds of local and traveling folk over the years, the crow eventually passed away.